Blackbaud (NASDAQ: BLKB), the world's leading cloud software company powering social good, today announced that bbcon 2018, the premier tech gathering for organizations and change agents driving social good, will take place in Orlando, Florida, October 9-11 at the Gaylord Palms Resort & Convention Center. Participate in meaningful conversations with social good leaders and practitioners around the biggest challenges, opportunities, and trends in the sector. Connect with technologists, marketers, administrators, fundraisers, and other social good professionals. Expand their vision by being the first to hear about transformative technology innovations coming from Blackbaud and its partners. Get inspired by fresh new ideas and content – all designed specifically for the social good sector – with powerful keynotes, memorable experiences and more. Attendees will also have access to dedicated content for various roles and markets – from arts and cultural organizations and cause-based nonprofits to educational institutions, healthcare institutions, foundations, corporate giving and more. 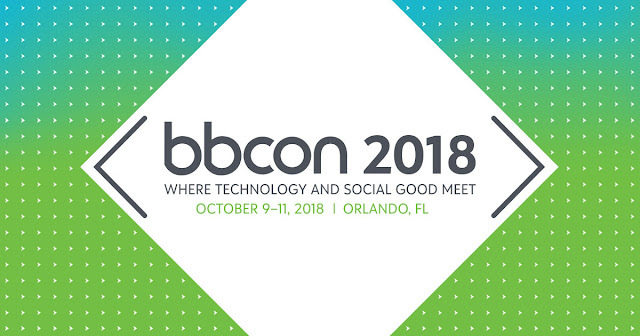 For more information and to register for the premiere tech gathering for organizations and change agents driving social good, visit www.bbconference.com.